Designers who are also buyers / agents/distributors of other labels preferred but not essential. 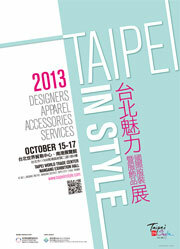 To actively promote Taiwan fashion industry, combine upstream and midstream industry’s research and development resources, and at the same time, encourage downstream industry to create and start its own brands, Taipei IN Style carries the mission of continuing and enhancing the competitiveness of the entire Taiwan textile/fashion industry. Last 2012 fashion trade fair not only brought together fabulous designers and unique brands from different countries, but it also provided a great communication platform for announcement of new designers/brands with numerous fashion shows and press conference for great media exposure. Sellers had plenty of opportunities to connect with potential buyers during well-arranged seminars and carefully planned business meetings. In addition, trend analysis and market forecast were presented at TIS 2012 forum and seminars for all interested parties.